The portal takes you behind the closed doors of one of the world’s most exclusive clubs. G20 member countries are responsible for the emissions of about 75% of global greenhouse gases and over 80% of world output. Without great leaps of progress by the G20 countries, we cannot curb global warming or meet the Sustainable Development Goals (SDGs). Still, the G20 excludes 174 countries, so efforts to make the G20 transparent and accountable to the world community are essential. The portal, “G20 in Focus,” features over 80 infographics, comparative maps, factsheets and articles, it’s an invitation to get involved in an honest, open and lively debate. One key feature is a new video, “What in the world is the G20?” in which furry animals describe the origin and purposes of the Group. The infographics show where each G20 country stands in terms of gender equality, reduction of greenhouse gases emissions, and transition to renewable energies, among many other things. It is striking to think of all the new world leaders that will appear at the German summit from Italy, France, the U.K., Brazil, and the U.S., among others! Certainly, President-elect Trump is a “wild card.” Usually, the planned G20 agenda is up-ended by whatever geopolitical crisis is “hot” when the leaders converge. Mr. Trump’s presence will enlarge the element of uncertainty that is always present at a summit. For instance, Mr. Trump’s “saber-rattling” at China is a risky way to approach that nation. As a climate denier, Mr. Trump is considering whether the U.S. should withdraw from the Paris Agreement. He has also promised to withdraw $3 billion from the United Nations and climate institutions, such as the GCF, exploit U.S. fossil fuel resources, and eliminate many regulations set by the U.S. Environmental Protection Agency (EPA). It remains to be seen whether or how Mr. Trump will follow through with such irresponsible policies. However, it is vital that, when it comes to the Paris Agreement and “Agenda 2030”, other nations continue implementation of their pledges and raise the pressure on the U.S. to do the right thing and not be a deadbeat. b) the Agenda 2030 plans of individual G20 countries. In both parts of the Plan, the G20 “cherry pick” the SDGs; that is, they select only certain SDGs as worthy of achievement. In addition, the G20 claims that its “business as usual” trade, investment, and growth policies will achieve SDGs when, in fact, these plans need reform. Around the world, there is an outcry against globalization policies that serve a few and leave the majority behind. Particularly with regard to infrastructure, Mr. Trump’s agenda overlaps with that of the G20. However, Mr. Trump’s infrastructure model, which offers big tax breaks to investors and construction firms, is not one that Germany should follow, particularly in its contract with Africa. Chancellor Merkel says that the priorities for the Compact relate to vocational education, private investment, and infrastructure. Africa can ill-afford deals which contribute to inequality, diminish the affordability of infrastructure services, and increase carbon emissions. There may be tension between the U.S. and other countries with regard to trade, since Mr. Trump seems to want to cancel or re-write some trade agreements. He does not believe that agreements such as the Trans-Pacific Partnership (TPP) or the Transatlantic Trade and Investment Partnership (TTIP) are sufficiently advantageous to the U.S. The TPP died before Trump could kill it. There is usually tension between the U.S. and Germany with regard to fiscal policy. The U.S. has urged more economic stimulus and less austerity than Germany has been willing to offer. Mr. Trump may feel more strongly about the importance of stimulus than Mr. Obama. Because 2017 is an election year in Germany, the Summit is being held early: 7-8 July in Hamburg. There is very little time to get things done, so the preparation process is moving speedily. The most important thing is to get as much participation in possible in influencing the views of the G20 governments, particularly the Sherpas (aides to Heads of State) and Finance Ministers. The Civil 20, led by two German Organizations (VENRO & AFD) are leading the consultation process. 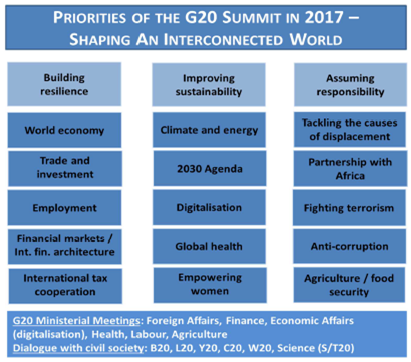 Please participate by indicating your views on what priorities the G20 should adopt for the 2017 Summit process here: http://civil-20.org/consultation/. The German Think 20, Business 20, Womens 20, Labor 20 will shortly have their own websites, if they do not already. Nancy Alexander is Director of the Economic Governance Program of the Heinrich Boell Foundation North America. For decades, she has headed up or worked with organizations to promote the accountability, participation, and transparency of global, regional and national governance bodies. They’re still talking in their high chairs ….. according to the Dutch government off-shore wind power needs no subsidies anymore in about 7.5 years. Who would build a fossile or an atom power plant now? I put in my pennyworth on the G20 just ahead of you. On Trump (you won’t learn anything) and knots (you might). Previous PostIs the Mexican Geothermal Potential Freezing?